Crafty, windy fingers have been playing in the garden today. The plastic children’s table is blown over, scattering the tea set across the bark chipped yard. The dolls have fallen off their chairs and onto the blueberry bush. On the spinning clothes line, whirling dizzily around, is the teddy bear. He has been cleaned and hung up to dry and now the wind is playing with him. When the wind came the children had fun. They put out their arms as if they were flying and let the wind blow them across the yard. "We're flying! We're flying!" they laughed. There were towels on the clothes line. The wind blew them and the clothes-hoist spun around like a big umbrella. Laughing, the children grabbed the towels and held on tight. Faster and faster they ran. The windy towels pulled them along as fast as they could go. They laughed and ran and nearly flew, but then the wind became too rough. Now the children have gone inside, their faces are flushed and their hair is wild. 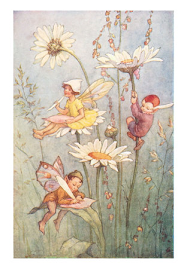 With the children gone, the fairies sneak out their flowery bush. They fly to the clothes-hoist and hold onto Teddy. It is their turn to play with him now. Around they go in a great big circle, just like the children did. It makes them laugh. They spin and spin, until the wind is too strong for their wings even with Teddy to help them. A peg lets go of one of Teddy's ears. 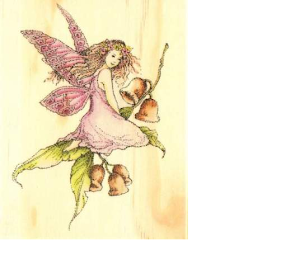 The fairies fly back to the camellia bush where the birds are hiding. They look out at the windy yard. There is a bowl of soapy suds that tipped over on the grass, the feathers of a little bird, broken shards of a flower pot, and a pair of trousers blown under the house. The fairies and the birds watch, safe inside their little bush where the shining leaves barely flutter.